Improve reliability in LNG and CNG applications. Designing a valve that performs consistently in cryogenic temperatures, high pressures, and thermal cycling of liquefied natural gas (LNG) and compressed natural gas (CNG) is one tough job. But choosing the right seal can make it a lot easier. This article examines the relationship between seal choice and LNG/CNG valve performance and important design criteria, such as material selection, seal lip geometry and energizer force. Here are ways to avoid common sealing mistakes that cost operation time, money and market share, plus a new “hybrid” technology with the potential to dramatically extend valve service life. For decades, valves of all types have played a key role in the movement of product throughout the energy industry. They are considered especially important in LNG and CNG operations, where they facilitate flow in processing, liquefaction, loading and transport stages. Under demanding service conditions, valves are expected to perform for long intervals with high levels of consistency and reliability, and their failure can present significant danger to people and equipment, as well as loss of productivity and profit. In LNG/CNG operations, valves can regularly encounter temperatures below -320 F (-196 C) and pressures above 750 pounds per square inch (psi). They are also subjected to periodic variations in temperatures known as “thermal cycling,” which can result in hardware expansion as well as shrinkage and material stresses. 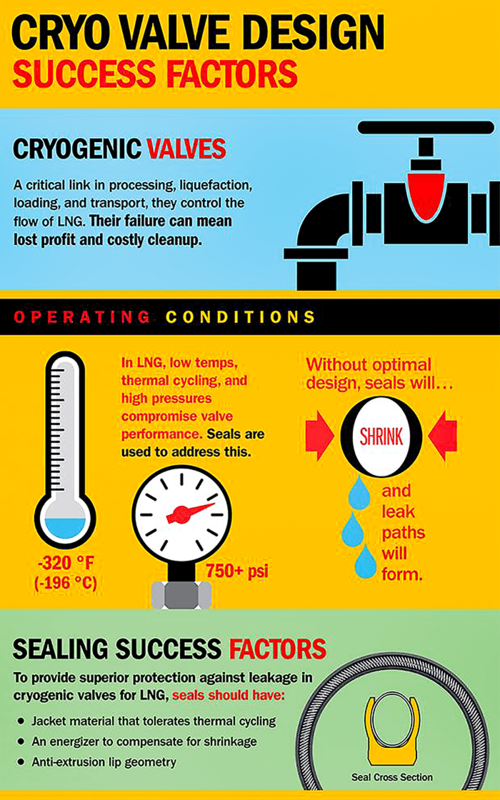 These factors make reliable, long-term valve operation an engineering challenge. Few components have more influence on the performance of a valve than the seal. Its job is to guard against leakage resulting from wear and tolerance variations in the valve hardware and, like the hardware, it is exposed to the harsh “freeze and squeeze” conditions of cryogenic service (i.e., those outlined in Shell Spec MESC SPE 77-300 and MSS SP-134-2006). It is no surprise that seal failure is usually caused by shrinkage, which leads to leak paths. At temperatures below -150 C, typical polymer seals exhibit roughly 10 times the shrinkage of the metal hardware in which they are sealing. In addition, their physical properties can change dramatically—tensile modulus can increase by 4 to 7 times, yield strength can increase by 5 to 8 times, and elongation can drop by as much as 50 times. All of this makes it difficult for the seal lip to energize, and nearly impossible for the seal’s jacket material to adapt to surface irregularities. With so many variables, it seems seals made from polymers would be a less than optimal choice for cryogenic valves. But with the right material formulation and design, they can actually provide much better sealing service than alternative technologies, such as metallic seals, elastomeric seals and packings—especially in dynamic applications. In fact, the right polymer seals can actually help engineers achieve new levels of valve performance. A primary area to consider when designing seals for cryogenic valves is geometry. Generally, a thin lip is recommended on the outer diameter of the seal for maximum flexibility, and longer lip design can help increase sealing area. A locking ring element can be employed to minimize the effects of shrinkage and prevent the seal from pulling away from the hardware. Materials are the foundation of the valve seal, and choosing the ideal formulation is critical. Polytetrafluoroethylene (PTFE) filled with various polymers such as polyimide and ultra-high-molecular-weight polyethylene (UHMWPE) materials are recommended for use in seal jackets, since they offer chemical compatibility, low friction, wear-resistance and extrusion resistance. They also exhibit good sealing effectiveness in a broad range of temperatures. At the heart of an effective valve seal is the spring energizer, which exerts a near-constant force on the jacket to promote effective sealing and even wear. Whether it is a canted coil spring, close-coil canted coil spring or helical ribbon spring, the energizer should be chemically compatible with the media it is expected to encounter, corrosion resistant and capable of providing a robust but measured deflection force. A spring-energized seal will benefit from the low-friction properties of the seal jacket material, and the force its spring exerts will help guard against shrinkage of the plastic ring. That same force ensures that the plastic ring maintains tight conformance against any irregularities or tolerance variations in the hardware, even at the lowest temperatures. Elastomeric seals or packings do not offer this same benefit because they are prone to uneven wear and compression set. Metallic seals are poor candidates for dynamic service conditions, since metal-to-metal friction is not effective for sealing. One area of emerging research in cryogenic valve sealing is the hybrid-energized seal. This technology will leverage the most desirable physical properties of two common energizer types to overcome the unique challenges of sealing in cryogenic conditions. Increasing the energizer force in a traditional seal is effective at reducing leaks, but only to a certain point. Considerable force is often required in cryogenic environments, and too much force can have negative consequences. The hybrid energizer currently in development allows the seal to exert extremely high force on the seal lip for tighter sealing with high deflection and high distributive load without damaging the seal lip. The seal can maintain contact under high pressure and low temperature conditions, counteracting the effects of shrinkage and hardware variations. 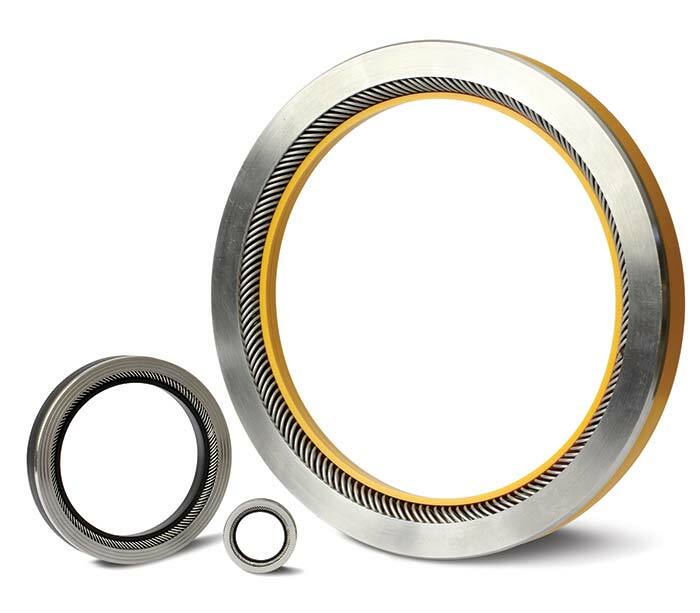 Preliminary testing of the hybrid-energized seal showed improvement over traditional cryogenic sealing solutions, and the seal consistently exceeded industry standards. Efficient, reliable valve performance is critical to the success of any LNG/CNG operation, and seals play a central role in keeping valves up and running. But their job is made difficult by the demanding service conditions. With a custom-engineered seal, valve designers can make adjustments to seal characteristics (lip geometry, jacket material formulation and energizer force) that will help address pressure and temperature requirements and achieve longer service life. Designers and original equipment manufacturers (OEMs) who partner with a custom seal manufacturer can access information about emerging solutions—like the hybrid energizer seal—that set new standards. Jim Harty is a global market manager for Bal Seal Engineering’s energy products. He works with design engineers to help OEMs and tier suppliers solve sealing, connecting, conducting, and EMI/RFI shielding challenges and create next-generation equipment. He may be reached at 713-446-6227 or jharty@balseal.com. For more information, visit www.balseal.com.